My professional career in astrology was delayed six months when my first two clients were both from the southern hemisphere. 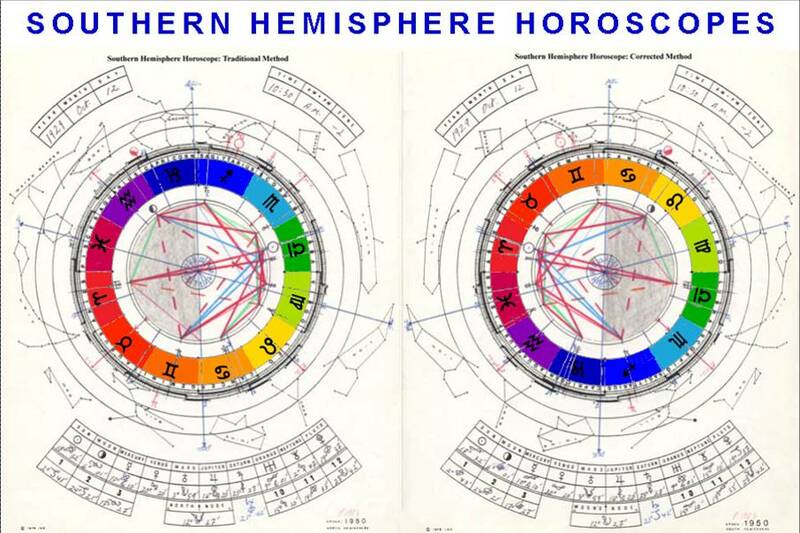 This article I hope will shed some light on a confusing and yet generally ignored astrological situation which all astrologers encounter sooner or later ….. that of the southern hemisphere horoscope. The Tropical Zodiac is the zodiac that measures or marks the seasons of the year. In other words it gauges the ever changing ratio of day and of night throughout the year. The main divisions of this zodiac are: 1. the two Equinoxes when the ratio of daylight to darkness in 24 hours is equal. These two moments mark the beginning of Spring and the beginning of Autumn; and 2. the two Solstices of the year when the amount of daylight or of darkness in 24 hours is the greatest. These two points mark the beginning of Summer (the longest day) and the beginning of Winter (the longest night). These four basic divisions are the seasons of the year. Each division has three phases, making in all the 12 SIGNS of the Tropical Zodiac. 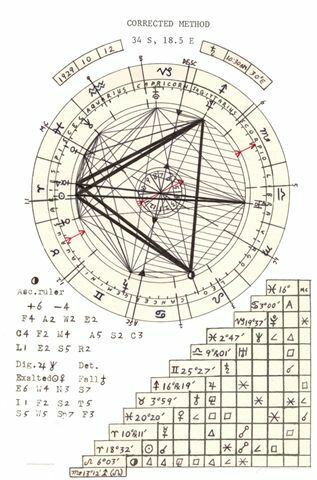 The Sidereal Zodiac consists of the 12 Major CONSTELLATIONS or star groups in the heavens through which the ecliptic passes. The ecliptic is the path of the planets and the Earth around the Sun. The dilemma starts because the 12 SIGNS of the Tropical Zodiac and the 12 CONSTELLATIONS of the Sidereal Zodiac have the same names but do not measure the same section of the heavens. For example: The Tropical Sign of Aries starts on the first day of Spring, but the Sun on that date would still be at the beginning of the CONSTELLATION of Pisces. The dilemma continues because at one time in the distant past these two zodiacs coincided with each other, so that on the first day of Spring the Sun would enter the SIGN of Aries and simultaneously would enter the CONSTELLATION of Aries. Although not exactly so, it may help to remember the Tropical Zodiac of Signs as measuring TIME (the timing of the Earth’s orbit and seasons) while the Sidereal Zodiac of Constellations measures SPACE (the spatial divisions of the heavens). The planets are where they are at any specific time. Their real positions and interrelationships will not change in either system however, the meanings given to the Tropical Signs of the Zodiac by Tropical Astrologers are basically the same as the meanings given by the Siderealist to the Constellations of the Sidereal Zodiac. How can this be possible? It is in fact contradictory. When the Sidereal Constellations were given their meanings, it was based on the agricultural and seasonal influences of the time. This was most likely the time when the two systems coincided several thousand years ago. We as humans can logically and honestly interpret the meanings and effects of the seasons on man. But it would only be guess-work or highly evolved psychic sensitivity and intuition that could determine the influence of the stars and their groupings. By this, I am not saying that stars do not exert influence, far from it. What I am saying is that for a psychologically valid and acceptable interpretation of the zodiac we must rely on the interpretations of the Tropical Signs of the Zodiac until such time as someone can develop a verifiable set of significances relevant to the Zodiacal Constellations. In the mean time stars can be used as individual points of energy and light. In 25,000 years or so, every star in the sky will pass through each Sign of the Tropical Zodiac. When considering the Southern Hemisphere, it would be so much easier for us to use the Sidereal Constellations as each planet will be in its place in one Constellation or another regardless of whether we view it from the Northern or Southern Hemispheres. However, as the Constellational meanings are questionable and contradictory to the seasons of nature on Earth, I am forced to disregard them on basic principles of logic. Many astrologers do not have sufficient astronomical understanding. A weakness that shows! The obvious consequences have occurred and still occur. In the remainder of this article an example Southern Hemisphere Nativity is used to: show the traditional and the Corrected methods of calculation, validate the true method, and shed light and understanding on some of the subtle implications involved. 1. Calculate Standard Time, Greenwich Mean Time, and Local Mean Time, as usual. 2. Use the G.M.T. to calculate the positions of the planets in the Zodiacal Signs. 3. Calculate the Sidereal Time of the place of birth as usual. 3a. Add 12 hours to the Sidereal Time to correct for Southern Hemisphere. 3c. Change each house cusp into the opposite cusp. In other words, the position of the Asc. in the T. of H. is actually the S.H. Desc., the MC becomes the S.H. 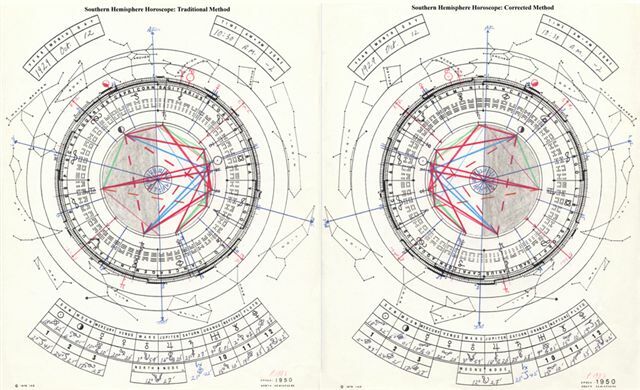 IC, the 11th cusp becomes the S.H. 5th, the 12th cusp becomes the S.H. 6th, the 2nd cusp becomes the S.H. 8th, the 3rd cusp becomes the S.H. 9th. This gives the Traditional S.H. 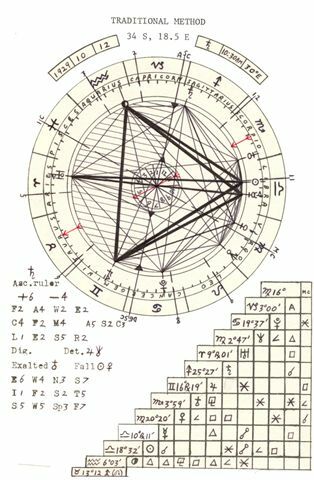 birth chart. Birth date: 1929, Oct.12 at 10:30 AM, Cape Town, S. Africa. 1. Standard Time 10:30 AM (30°E), GMT 8:30 AM, LMT 9:44am. 2. Su 18°32’Lib, Mo 6°03’Aqua, Me 10°Rll’ Lib, Ve 20°20′ Vir, Ma 3°59’Sco, Ju 16°Rl9’Gem, Sa 25°27’Sag, Ur 9°R01’Ari, Ne 2°47’Yir, Pl 19°37’Can, N.Node 13°12’Tau. 23° 05′ 18″ = corrected Sid. T. for S. H. place of birth. 3rd H. 18°Aqua, 11th H. 20°Lib, 12th H.28°Sco. 1. Calculate Standard Time, G.M.T.,& L.M.T. as usual. 2. Use the G.M.T. to calculate the exact positions of the planets in the Zodiacal Signs. 2a. Then change each Sign into its opposite. 3b. Look up the Asc., MC, and House cusps as usual in the Table of Houses. Pl 19°37’Cap, N. Node 13°12’Sco. 23° 05′ 18″ = corrected Sid. T. for S.H. place of birth. 3rd H. 18° Leo, 11th H. 20° Ari, 12th H. 28° Tau. In comparing, all the planets in each chart are in opposite signs. Their positions are reversed in the Zodiac of Signs. This does not change their position in the sky at all. It simply changes the viewpoint. For example, a tornado in the Northern Hemisphere spirals counter-clockwise. In the Southern Hemisphere tornadoes spiral clockwise. A tornado will not cross the Equator unchanged. In the Northern Hemisphere we look South to see the Sun and it will rise on our left. In the Southern Hemisphere we look North to see the Sun and it will rise on our right. Day spirals one way when viewed from the Northern Hemisphere. Day spirals the other way when viewed from the Southern Hemisphere. Clearly, the character traits and potentials indicated in the natal chart should be recognizable in the person. Also with such extremes one should be able to tell right away which is correct. Speaking from my own experience however, I usually have to look twice and much deeper. Remember that Summer and Winter can and do happen at the same time on this planet and they are both simultaneously within our natures and chart (either consciously or subconsciously, for lack of better words). Let us refer to the native of this chart as Mr. Jones. It is not his true name. Mr. Jones was born Oct. 12, 1929 in Capetown, South Africa, at 10:30 A.M.. In 1930 his family moved to the Northern Hemisphere; first to England and then to the U.S.A. In 1934 his parents divorced and he came to Canada to live with an Aunt. In school his singing and musical ability came out and so did a strong interest in drama. In 1947 he went to the U.S.A. for University and graduated in 1950 with a B.A. in Drama. One summer he went on a bicycle tour around England. On graduating he served in the Army Medical Corps in the Korean War, 1951-53. He was transferred to special services at the request of higher ups. He then gathered some troops together and presented concerts at various U.S.A. camps. He also did some theatre and film work while in Japan. In 1953 he returned to U.S.A. and was improperly treated for a cyst under the tongue. He was severely burned by boiling water treatment and developed gangrene and osteomalitis of the jaw. He came to Canada for successful treatment by his Aunt who was a doctor. In 1954 he returned to New York City and did radio work and studied drama. Then he went to study drama in England after which he toured in plays all over England. He married in October 1960. Theatre in England declined and he returned to Canada in 1961. His first daughter was born in 1962. She was rejected by her mother and Mr. Jones personally took care of her. …. numerous radio and T.V. plays and work at Stratford etc……. until 1964 when in another low theatre time he moved to the U.S.A. and began theatre tours of America. In 1967 he bought a home in California. Later in 1967 he lost a lot of money in the stock market. In 1967 he adopted a son and then his wife had a son of her own. His sister died in 1969 and his mother passed away in 1970. He then returned to Canada (1970) but his wife refused to go. They separated and in 1972 were divorced. He remarried that same year to a lady with 3 children from her previous marriage, to match his own three that he was in custody of. He bought a home in Canada, also in 1972. Theatre work has been on an upward spiral for him since. Just from looking at the Sun-Moon combinations of this active dramatist it becomes obvious that the Aries Sun and Leo Moon are predominant and the main lights in Mr. Jones’ life. (-) Mercury in Libra (Traditional) shows an impartial and often indecisive mind. (+) Mercury in Aries (Corrected) shows a courageous, pioneering, alert mind which might show as impatience when not active or as the ability to make quick decisions. Mercury in Aries again would seem to be the correct placement as it would certainly take many rapid decisions to move around professionally as much as Mr. Jones has. (-) Venus in Virgo (Traditional method) restrains, analyzes, criticizes, and thereby cools the emotions. Romance becomes intellectualized. (+) Venus in Pisces (Corrected Method) shows a highly emotional and tenderhearted person. An impressionable romantic. Poetic and musical. A martyr who is self-sacrificed in love. Venus in Pisces seems the more appropriate for a musical and theatrical person. (-) Mars in Scorpio (Traditional) – intensely passionate. Determined initiatives and deliberate action. Domineering, cruel, and bitter. Disregards others feelings. (+) Mars in Taurus (Corrected) shows practical initiatives. Perseveres to overcome obstacles and move mountains. Possible artistic activity. Mars in Taurus again seems the most appropriate as Taurus is ruled by Venus. (-) Jupiter in Gemini (Traditional) – too much travel and experience can be confusing and detrimental. Love of travel. Fast traveling. Expansive intelligence. (+) Jupiter in Sagittarius is dignified (Corrected) Much long distance traveling. Love of out-of-doors, adventure and travel. Enthusiastic. Vast understanding is often matured through travel. This decision is more difficult but a dignified Jupiter seems to apply more as Mr. Jones has benefited greatly from his travels. (-) Saturn in Sagittarius (Traditional) shows austerity and dignity. High minded ambition. Enthusiastic administration. Inspiring career. Responsible expansions. (+) Saturn in Gemini (Corrected) – strategy. Persuasion. Structured, restrained, or regulated use of words. Profound. Ambitious thinker. (-) Uranus in Aries (Traditional) – impulsive and abrupt initiatives. Explosive individuality. Temperamental. Fast and furious. Unexpected adventures. (+) Uranus in Libra (Corrected) -ruled by Venus -unique relationships, sociable & artistic individuality. (-) Neptune in Virgo (Traditional) -psychic discrimination. Vagueness about diet health and duty. (+) Neptune in Pisces (Corrected) – Mystical, psychic. Sensitive. Strange dreams, perhaps prophetic. Love of poetry, music and theatre. Intuitive. (-) Pluto in Cancer (Traditional) -exerts will power and authority at home. Powerful need of security. (+) Pluto in Capricorn (Corrected) – authoritative administration of career. Power is expressed through ambition. The planets remain in the same houses in both systems and the aspects are the same in both systems. What changes is the sign that the planets are in and the sign of the Ascendant, Midheaven and other house cusps. la. In the Corrected Method: Venus and Neptune in Pisces take over the rulership of the entire chart by disposition. Saturn rules Capricorn and therefore Pluto; Mercury rules Gemini and therefore Saturn; The Sun rules Leo and therefore the Moon; Mars rules Aries and therefore the Sun and Mercury; Venus rules Taurus and Libra and therefore Mars and Uranus. Venus is exalted in Pisces and Neptune rules Pisces. Jupiter rules Sagittarius in the 6th House. Venus on the MC points to an artistic career, with Neptune highly elevated as well, the theatre and music stand out …. especially since Venus, MC, and Neptune are all in Pisces. lb. In the Traditional Method: Venus is still quite prominent but is in mutual reception to Mercury and shares the depository rulership with mars. This would, in comparison to the corrected method make the potency of Venus on the M.C. in Virgo the lesser. Furthermore, Venus, MC, and Neptune all in Virgo would tend to take away from a theatrical or music-al career and point more to something more intellectual like writing or perhaps being a critic. 2 a. For a traveling man of theatre to take custody of his 3 children upon separation and divorce, a Cancer Ascendant (Corrected method) certainly seems appropriate. Mr. Jones has a somewhat round, sensitive and Moon-like face. His emotional sensitivity lends itself well to the stage. 2b. A Capricorn Ascendant would suggest a lean bony person who would likely be turned inward with private difficulties. This certainly doesn’t sound like someone who could spend so much time giving out emotions on the stage. Neither does Mr. Jones have the appearance of a Capricorn Ascendant. 3a. The GRAND TRINE between Sun, Mercury – Moon -Jupiter by the Corrected Method is in FIRE Signs which would give a definite accentuation on inspiration and activity. This inspirational energy emphasis would most naturally find a place to burn in dance or theatrical realms. 3b. By the Traditional Method, the GRAND TRINE is in AIR Signs which would give a definite mental accentuation in the life. The native would be an intellectually self-sufficient individual. This mental energy would most naturally find an outlet through study, or writing, or talking. My conclusion is that the Signs of the Zodiac, being the seasons of the year, must be reversed for a Southern Hemisphere nativity. The following charts were added to the original article because they presented the distinctions in a new and improved manner. These charts show the relation of the constellations and Sidereal Signs to the Tropical Signs of the Zodiac. The symbols on the inner wheel for the Tropical Zodiac have been changed. The traditional symbols are used for the Sidereal Zodiac. There are two degree grids. The outer one is Sidereal and the inner is Tropical. This allows for a correct precession of the Zodiac, and for planetary positions to be plotted in either system without having to calculate the other. The Sidereal system is shown as 30 degree marks on the outer degree grid. The actual sizes of the constellations are also shown here. (See article on 3 Zodiacs for more information). If you imagine these charts as back to back, like the two hemispheres are, your perspective will be enhanced. Note: The Northern Hemisphere Signs move counter-clockwise while the Southern Hemisphere Signs move Clock-wise.